Will forms are required when one needs to write a will for legal purposes. The will is a legal document that is written when one decides to distribute his moveable and non-moveable assets to family members or any particular person. Will is a legal statement about actions that shall be carried out in future when the will owner passes away. Will forms are available in both PDF and Word formats. Below is the list of will forms that have been written professionally and adhere to legal standards of a will. You may also see Will and Trust Forms. As the name suggests this is a simple legal will form that is a legal application form for last will and testament. The form includes information such as client’s information, general information etc. The format is available in the word format from the below download link. You may also see Living Trust Forms. This is a simple yet professionally written will form that comprises of all essential information to execute a will for a single person that has never been married. The will format is available in the name of heading source link below. Available in PDF format, this is a simple last will and testament form which is available online. 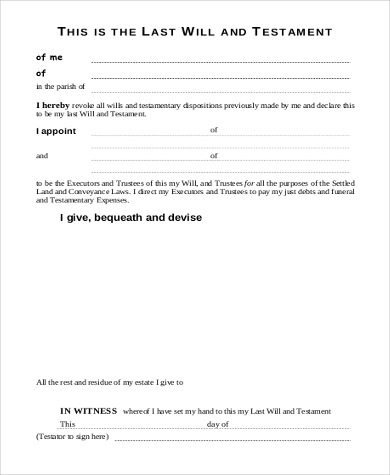 The format includes the name of the person concerning the will and the declarations made by him. 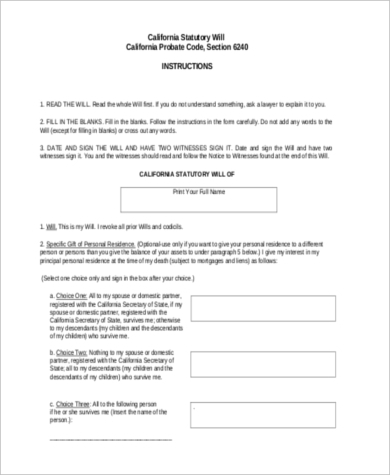 The format includes blank spaces to fill in the crucial information needed for legal use. 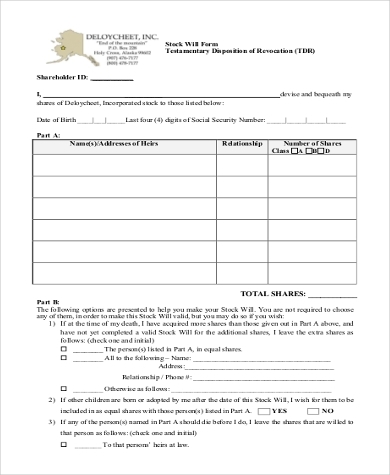 This is a standard will form that is available in PDF form and can be obtained from the download link given below. 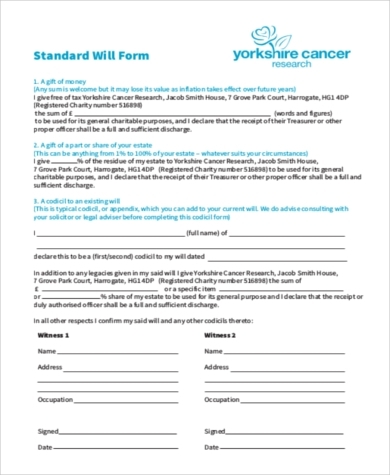 The format includes information about the will in parts such as ‘a gift of money’, ‘a gift of a part or share of your estate’, ‘a codicil to an existing will’ and the details of witnesses etc. You can also see Free Will Forms. As the name suggests this will form has been exclusively designed for wills related to stocks and shareholders. The format includes blanks for information such as shareholder ID, security number digits, date of birth, name of heirs, relationship, the number of shares etc. The living will form is used when the person is either in end-stage condition or in persistent vegetative state or in a terminal condition. The form also declares the detailed meaning of each condition under which the will has been written. 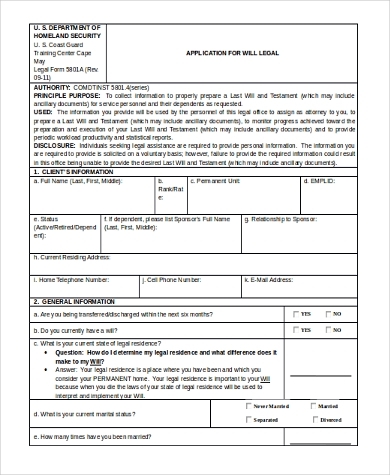 This form is available in PDF format from the heading source link below. 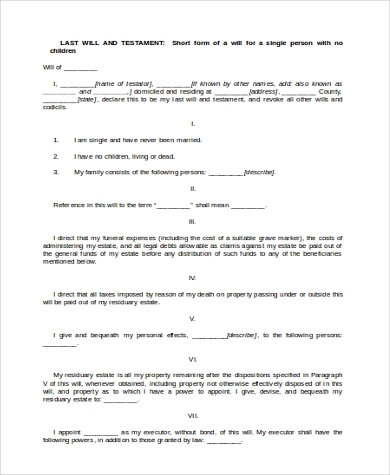 The will preparation form encloses all the details needed for a person who wishes to write a formal will for himself. Statutory Will Form is professional will format that carries in-depth information about the person concerning the will. The form is available in PDF format and can be obtained from the download link. You write a will document to decide the distribution of your assets after you have passed way. A will is a legal document and is very crucial for the family members. If a will isn’t written properly it might hamper the peaceful distribution of wealth and property leading to conflicts between the family members. Clearly mention the name, relationship, and share that you wish to give to any family member or a particular person. Declare all your moveable and non-moveable assets and its distribution clearly. You can also choose a representative to read your will document. You must also consult a lawyer to finalize a will document. You may also see Free Living Will Forms. How can I Get a Will Form? Will forms are easily available online. These will form are available for various purposes like a single person will form, stock will form, statutory will form, living will form etc. Just click the download link to save it on your device. Once downloaded, you can edit, fill and get the print to be used for legal formalities. Will forms are written professionally be experts and therefore theses forms are legally acceptable. 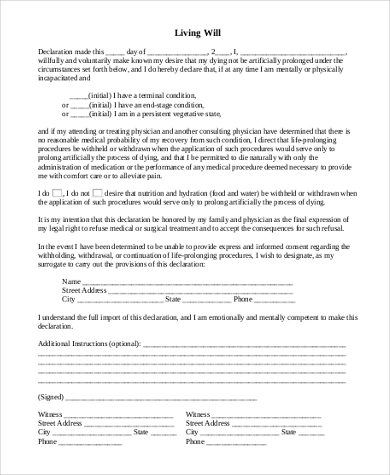 The will forms include in-depth details of will to avoid any legal disputes between the family members. 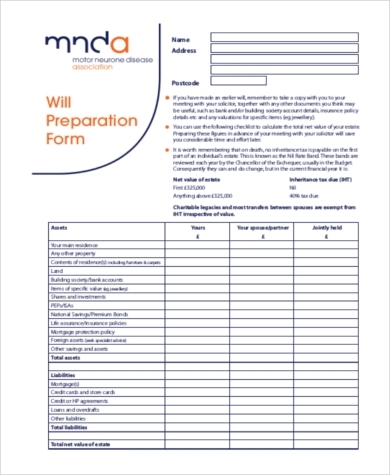 The will forms are available with a source link heading in both PDF and Word format. You can also see Will Forms. Will forms are legal documents that one prepares before passing away to decide the distribution of their assets. A will form includes information such as the name of the person, details of the assets, details of the witnesses, details of the people to whom the assets are being distributed and the share of assets. A well-written will document is helpful in avoiding legal disputes later.